Forty years of experience in the performing arts including recording projects and theoretical studies, six off Broadway musicals, and thousands live performances. Performing solo and with full symphonic productions has placed Gene in a category far beyond those of mortal chord bangers. Performances range from landmark theaters, resorts, country clubs, and smoke filled taverns from Goose Rocks Beach Me. to Fort Zachary Taylor, Key West, Fl. The most notably performance was for President Gerald Ford & Queen Elizabeth II. With influences ranging from Mozart, to Zappa, Gene's compositional skills are exceptional. Utilizing the latest digital technology Gene produces music with structural integrity as well as harmonic diversity and color. The combination of his guitar and vocals, produce an extraordinary, dynamic, and charismatic performance. Audiences enthusiastically display both amazement and respect for this uniquely talented entertainer. A newly released CD titled "Larger Prey" is self produced, engineered, written, arranged, and all instruments and vocals are performed entirely by Gene. This musical work truly defines the artist's undeniable talents. RadioIndy is pleased to announced that we have published our CD Review with Gene Hilbert music to iTunes.com. FANS - Please checkout Gene Hilbert iTunes page here and play / purchase some great new music! 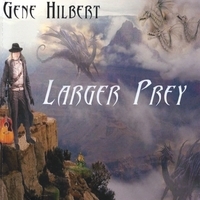 RadioIndy is pleased to present Gene Hilbert with a GrIndie Award for the CD "Larger Prey"
Seasoned performer Gene Hilbert’s latest release, “Larger Prey,” is a collection of original music fused with classic rock, jazz, and blues. A one-man show, Hilbert not only is the vocalist and guitarist but also has creatively performed every other instrument. The album’s high-quality production is heard in each track, and each track is arranged with excellent distinction between instruments and vocals. Subtle bell sounds and horns complement the razor sharp guitar on “Morning 20.” Harmonic guitars highlight the moving piece “March to Baghdad” as it takes on a sound of its own. Vocals are low and clean while the harmonies are perfectly layered on “Talk To Me.” Hilbert has taken different musical styles and has compiled a wonderful selection of songs with powerful guitar melodies. “Larger Prey” is a guitar driven album that is well worth hearing, especially for listeners who enjoy Joe Satriani or Santana.